My son LOVES Carnation Breakfast Essentials® Powder, so much so that we’ve been known to go through 2-3 glassfuls mixed with milk in a day. Lately, we’ve starting mixing it up in a variety of smoothies to try something different. One of our favorite smoothies is our Chocolate Peanut Butter Banana Smoothie, that is jam packed with goodness. Want more great smoothie recipes? We’ve found a ton in this eCookbook. Smoothies are so easy to make that my daughter has taken to making them on her own almost every single morning. 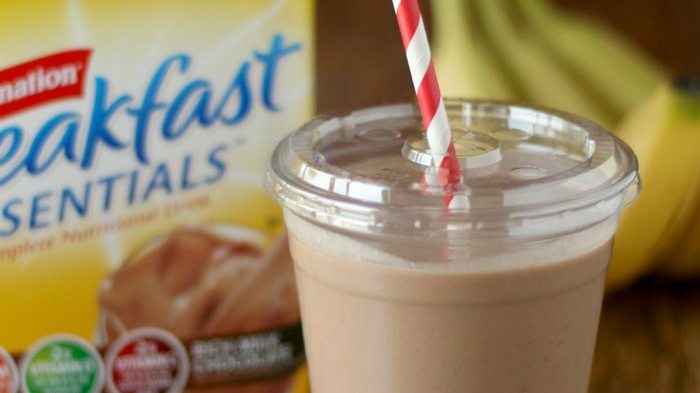 It’s a mom-approved way to get lots of nutritious ingredients all in one easy to consume breakfast. Our Chocolate Peanut Butter Banana Smoothie is equally amazing with the quality of ingredients it includes: Carnation Breakfast Essentials® Powder (chocolate), peanut butter, a banana, and milk. Use frozen banana slices or add in a few ice cubes and blend! You’ll be drinking up a super smooth morning smoothie in no time at all. Carnation Breakfast Essentials® Powder is a great way to get extra nutrients into your picky eaters. If your kids are anything like mine, sometimes they are so busy they don’t want to sit down to eat a healthy breakfast. At times like those, having a drink that packs a healthy punch is ideal. Carnation Breakfast Essentials® Powder contains 21 vitamins and minerals, 13 grams of protein, and as much calcium as 6 ounces of yogurt. It’s nutritious for kids, teens and adults. With several great flavors to choose from, Carnation Breakfast Essentials® Powder can be used as an ingredient in a wide range of smoothies. I plan to try just about every smoothie idea that are on this list of Carnation Breakfast Essentials® Powder Smoothie Recipes. You can’t go wrong with choices like that! You can find even more great ideas when you follow Carnation Breakfast Essentials on Facebook. Combine all ingredients in blender until well blended. Serve. I just love this idea. I am always looking for a quick breakfast that will stay with me all morning. I am going to do this one. I’m visiting from Serenity Saturday blog hop. Sorry you didn’t like it. Yes, it is a thinner shake. We loved it, but everyone has different tastes. My 4 year old daughter had her tonsils out yesterday. Just TORE UP this shake. It’s perfect!